A proposal by Vermont Gov. 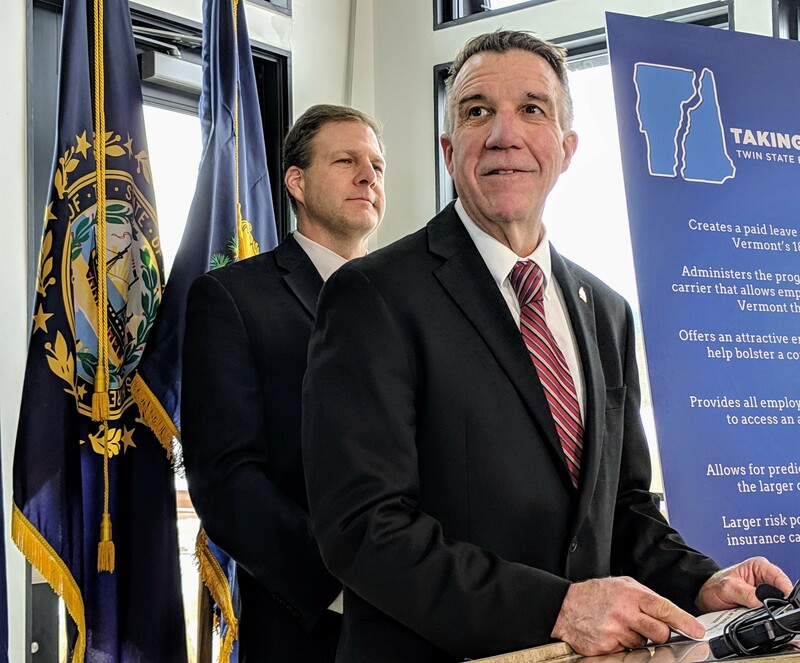 Phil Scott and New Hampshire Gov. Chris Sununu would provide paid family leave for employees of both states through an insurance system that would also be open to private businesses and individuals who opt to join. The Republican governors presented their plan Wednesday at the Schilling Beer Company in Littleton, N.H. The proposal would allow covered employees to take up to six weeks of paid family leave while receiving 60 percent of their usual salaries. Businesses enrolling their entire staff would get a discount on premiums, Scott said, but the insurance would be available on an employee-by-employee basis as well. Workers at businesses that don’t opt in to the program could sign up individually, Scott said. Last year, Scott vetoed a bill to create a family leave program because it was not optional, and it would have been funded by a payroll tax on Vermont businesses. Under the proposal, a private insurance company would administer the benefit. Scott said Vermont state workers wouldn’t have to shoulder any of the cost. Administration staff briefed the Vermont State Employees' Association as the plan was being announced, Scott said. Critics of Scott’s position have said a voluntary program would not create a large enough risk pool — the number of people covered — to provide a meaningful benefit to employees on leave. The Vermont Family and Medical Leave Insurance Coalition, which is made up of social services organizations, advocacy groups and unions, condemned the proposal after Scott teased it in his inaugural address last week. “Without a universal insurance pool, the program will become cost-prohibitive for Vermonters and Vermont small businesses,” the coalition said in a statement after the speech. Coalition co-chair Ashley Moore, the state director of Main Street Alliance, said that the coalition remains focused on a mandatory, universal program. Steve Howard, the executive director of the VSEA, said Wednesday afternoon that the union supports a mandatory statewide paid leave program similar to the proposal Scott vetoed. But he said the announcement was a promising step. Howard said the union isn’t likely to change its position. “My inclination is, we will stand behind a more robust mandatory plan,” he said. On Wednesday, Sununu said the scope of the proposal, which would include the 18,500 employees of the two states, would make the program viable. “The larger combined state employee risk pools help make the pricing much more predictable, much more stable, within the two states,” Sununu said, adding that the larger pool will generate interest among private insurers. Both governors said the proposal requires no federal involvement. “You have two governors that are smart enough to not rely on the federal government for much lately,” Sununu joked. The proposal would require support from each state’s legislature. Part of that support would be budgetary. Scott said the program is expected to cost Vermont $2.4 million to $2.5 million annually for the state’s 8,500 employees. Private businesses or individuals participating in the plan would pay premiums and receive payouts directly from the private insurer running the program, Scott said. Sununu said a number of insurance companies have expressed interest in running such a program, though he didn't name specific firms. Both governors said they were unaware of any similar multi-state initiative, but Sununu suggested other states could join the program once it's up and running. Scott said the program would offer the possibility for affordable voluntary paid family leave in the private sector. “It depends on how many are in the pool, obviously, but from my back-of-the-napkin-type of projections, about a buck a day,” Scott said. Thursday morning, Senate President Pro Tempore Tim Ashe (D/P-Chittenden) and House Speaker Mitzi Johnson (D-South Hero) are expected to present “a statewide family and medical leave insurance program” of their own, according to a press release from the coalition. Ashe was not immediately available Wednesday to comment on Scott's plan. Johnson, who was briefed on the plan by Scott’s chief of staff Jason Gibbs, said she’s concerned that it would fail to help some of the Vermonters who need it most. Johnson also said Gibbs told her that benefits would be available only to people who have been enrolled in the insurance for a full year. She said the opt-in concept could present problems for Vermonters with unplanned pregnancies or family emergencies. “You have no idea when your spouse is going to be diagnosed with cancer, when a grandparent’s going to fall down the stairs,” Johnson said. Scott struck a conciliatory tone Wednesday, asking that lawmakers keep an open mind about his proposal and recognize that he shares their goal of paid family leave for Vermonters.